A very simple riff on spaghetti a la vongole (or little manila clams), based on the contents of our deep freeze… Set a pot of water on high heat and when it comes to a boil add a small handful of salt. Add the spaghetti noodles and immediately turn on another burner to high heat. Place a large skillet on the burner, and when hot, add several tablespoons (5-6) of olive oil. Add 3-4 cloves of garlic, thinly slivered and sauté for a few seconds until fragrant, add some dried chili pepper flakes or fresh siling labuyo if you prefer. Immediately add some baby octopus, tentacles only, shelled baby mussels and some de-veined shrimp and let this cook for a minute or two. Add a cup or so of white wine and let this all come to a gurgle and burn off the alcohol. Do not be alarmed if the skillet seems to be swimming in liquid, that’s all the water coming out of the seafood and it is flavorful, particularly when it is reduced to concentrate the essence of seafood. Season with salt and pepper. 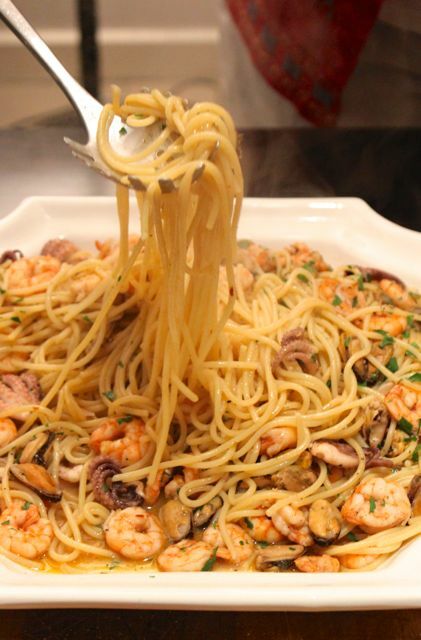 Add the cooked al dente noodles directly to the skillet with seafood and mix thoroughly over low heat. Add some pasta water if it looks a bit dry. Drizzle with more olive oil, and sprinkle with chopped parsley. Serve immediately. So quick and so easy. And the taste is more complex than you would imagine for so little effort. After a few minutes, any liquid in the serving dish will probably be absorbed by the noodles. I know it is considered a SERIOUS NO-NO to mix cheese with seafood pasta, but I tried a bit of freshly grated parmesan on a portion of my spaghetti and it tasted wonderful, despite the rules. We had this large platter of pasta along with a generous salad bar, and several home-baked pizzas as well. Very satisfying. That’s my favorite. So easy to make and tastes great too, just as you said, for a minimal effort esp. if you just use Manila clams. I’ve never heard of the don’t mix cheese with seafood pasta rule. I put cheese on anything pasta. Some of the food rules, I surmise, were grounded in poor exposure, ignorance and politics. For example, most would pair cheese with a red wine. Fact is, white wine actually goes better. Due to the saltiness of the cheese reacting to the tannins in red, one gets a metallic tang thereafter. Think about it – if forced to, which dish would you rather add cheese to, a beef bourguignon or white wine mussels? I believe your sensibilities will lead you to the mussels. Hey Marketman, where can one get good octopus in Manila? I mean, is there fresh octopus readily available in the wet markets? My favorite as well, and looks quite easy to make. From my understanding, the “no cheese with seafood” rule is strictly in Italian cuisine. oh MM! 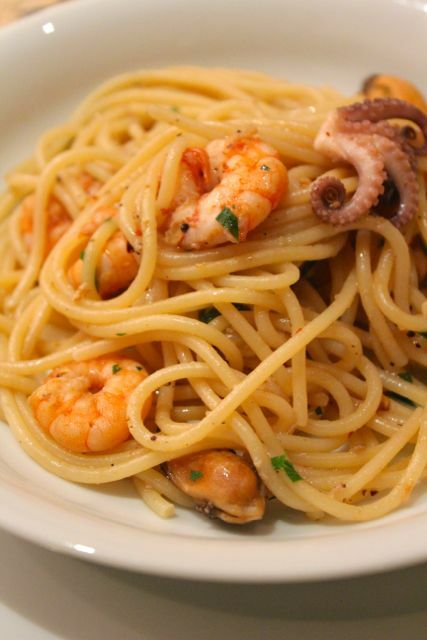 I just came from Italy early this week for CAnonization, and i ate this food in VEnice! Until now, i can’t forget the taste! soooo yummy! Marketman, where do you get baby octopus? I haven’t seen baby octopus in the groceries I frequent. Do you have a secret place where you get them? This looks an easy meal to whip up, and it I get hungry just looking at it. Great pictures by the way. 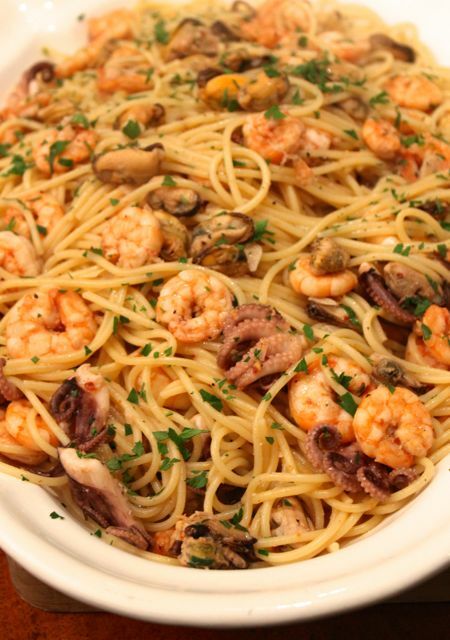 And about the cheese and seafood pasta combination, I think the bottomline should be whatever tastes good together should go together, social conventions be damned. Dale & Jek, finding baby octopus isn’t so easy. I happened to spot these a few weeks ago at S&R Makati and bought them frozen (though I hear from the grapevine that there have been some recent problems with their freezers) which is supposed to be fine as the deep freeze can help to tenderize the octopus. I have also seen them at Seaside market in Baclaran, occasionally at Farmer’s market in Cubao and at weekend markets. When I run across them at the Nasugbu market or markets in Cebu I load up and freeze. I wish there was a steadier supply of them, but as with many produce items in Manila, it’s incredibly unreliable and erratic. Clarissa, yes, the mussel juice is superb, just like clam juice. Rob, yes, Italian food… as the Greeks, nearby pair shrimp with tomatoes and feta cheese and that’s brilliant… Khew I like that comparison “cheese is nature’s MSG”… so true. love this!! i can eat the whole plate! thank you!!! i’m cooking this this weekend! oh, did you have left overs? how did it taste like? Just want to share…I made this and brought it at a potluck. I had to modify it by using canned clams (no baby octopi here). It was a hit even though I had to reheat it. Thank you!!! I hope this does not imply that MSG is in anyway unnatural. It’s simply an isolate of umami laden vegetation found in nature, e.g. sea weed. Its reputation is tainted mainly by the bad company it keeps, usually among the rest of scary technical initials listed as ingredient for processed food. Unlike table salt and other traditional preservatives, there is no body of knowledge linking the use of MSG to disease although it has been in use now for more than a hundred years in Japan and China. Nevertheless, reliance on the convenience that it affords the cook, I gather, is glanced at obliquely as unpraiseworthy kitchen practice. Why? Perhaps because to many who never needed to venture farther than the dining room, kitchen work is not virtuous unless it is a slow and tedious chore and drudgery. I treat it as a lifesaver. For those emergencies when despite all your best efforts the result is still underwhelming and the only thing that separates you and a culinary disaster is the MSG caster.